When Trader Joe’s started carrying Gardenburger Riblets, I thought I’d died and went to veggie bbq heaven. Then I moved to the Danish countryside, where procuring something as simple as tofu or tempeh means keeping track of the Asian shop’s biweekly delivery schedule. So, my chances of finding a pre-made veg-friendly barbeque anything here are somewhere between slim and none. But I love a challenge, and I love seitan, so now I make my own vegetarian barbecue ribs. The only catch is I have to get my vital wheat gluten in my travels, or order it from the UK with crazy shipping charges. But, it’s totally worth the hassle! Stir together the dry ingredients. In a separate bowl, whisk together the wet ingredients, then add them to the dry ingredients and stir the mixture just until it’s combined. You don’t want to activate the gluten! Grease a baking sheet, then press the dough into a rectangle that’s approx. 12″ x 6″ or any shape that’s uniform 1/4″ – 1/2″ thick. Cut it down the middle the long way, then cut it into whatever size strips make you happy. I make mine with sandwiches in mind, so if you’re planning to eat it as “ribs” you might want to adjust your dimensions. Bake it at 350 degrees (175 celsius) for 25 minutes, or until it starts to puff up. Then brush the top with barbeque sauce and stick it under under the broiler for 5 minutes, or until the sauce starts to caramelize. You can flip it and repeat the sauce protocol on the other side, but it’s sort of messy and it’s totally ok to skip it. 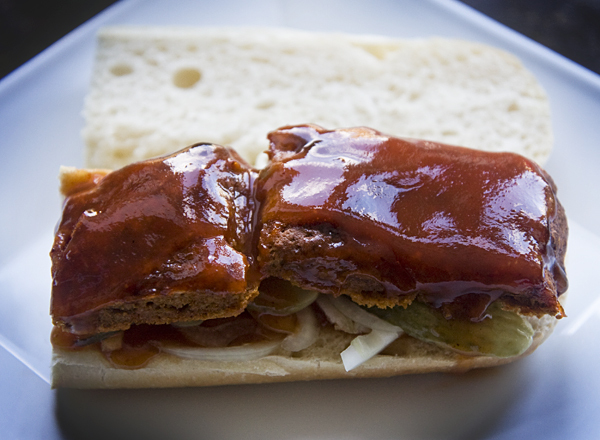 Then, as a nod to the sandwich that started my barbeque luv way back in the early 80’s, I eat my riblets on a baguette with pickles, onions, and lots more barbeque sauce. Whisk everything together, bring it to a boil then simmer it uncovered for 10 minutes, or until it’s as thick as you’d like it. So it’s not exactly a McRib, but I can have it anytime I want, and it’s a bit less frightening than the “restructured meat product” (e.g. a mixture of tripe, heart, and scalded stomach) that passes as the original. Bon appétit! Oh gosh – I looove seitan. Thanks so much for the recipe! I’ve made seitan with ordinary flour – it works well but be prepared to have your hands either immersed in, or under really cold running water while you knead it. It’s quite ouchy but absolutely worth it!